We are announcing a bounty for visualization of live data coming from the æternity blockchain. 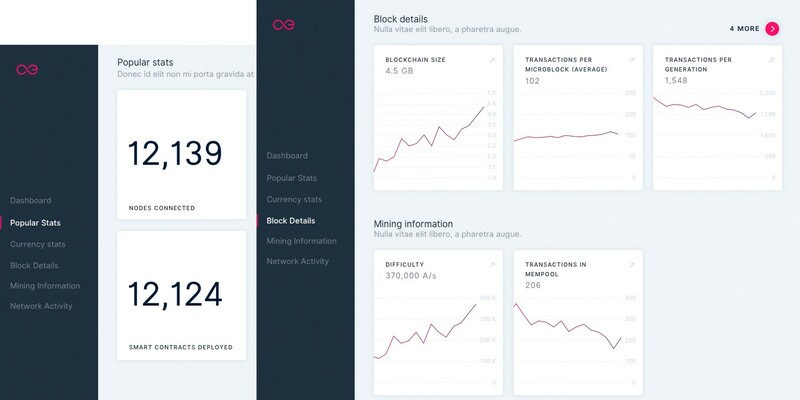 In addition to continually improving the æternity Blockchain Explorer, we would like to see the æternity community involved in making dashboards. This contest is open to anyone who has reached the age of maturity in their country of residence. Teams are free to participate, but the award will be sent to a single AE address. These submissions should be a fully-functioning web applications. The submission should visualize data in the following categories: core (e.g., top block, transactions per day), currency stats, block stats (e.g., difficulty, key blocks mined), mining stats (e.g., transactions in the mempool, block reward), and æternity protocol (e.g., oracles queried, state channels opened). The submissions should be open-source and posted on GitHub. After the submission deadline has passed, members of the æternity team will evaluate all entries and select the winners. The bounty amount is 3000 AE. We are looking for designs consistent with the æpps Styles guide (available at the link below). For your convenience, we have also included the fonts that we use. We have also prepared a reference sketch for the type of data and visuals we would like to see. We welcome all submissions and don’t want to constrain your imagination in any way! We are working on the actual blog post currently. Judgement day is after the deadline. We will create a topic with all entries here in the Forum and will allow users to vote for their favorites. The final decision will rest with the æternity team, however. Ok thank you Vlad. The low down = deadline of mvp submission. So registration is there and how long do we have to implement this funky dashboard? Question, do we have to provide the statistics backend or are those statistics going to be provide by epoch for us? Do we have to develop whole website or just the design and mock-ups? have a look at the “Rules and Eligibility” section. Epoch allows you to access quite some data, but you might want to write your own backend to accumulate more data about the chain. You can use some of the public nodes, for example: https://sdk-mainnet.aepps.com/v2/status to start hacking. I’ll do my best to build a nice block explorer! I am not sure whether I could achieve all requirements in the next ten days, but it’s my honor to try. The issue is it provides data. instant data. point data. no history, no timestamp, no back tracking. that is what I was asking. without developing something extra having trends show for the past is not possible. Difficulty, peer_count, pending transactions, solutions. Gensis block, listening, network id, node revision, node version, protocol and syncing. This is my personal website of aeternity explorer and stats tool, Currently supporting the English and Chinese Language. I made this not for the bounty, My motivation comes from more and more people can use my website and giveme advices, so that i can make it more user-friendly and humanreadable. I am on my way to make it a extremely nice tools,Hoping you guy’s advices. You can also use the aepp-middleware to get some of the data for you. It’s in github at https://github.com/aeternity/aepp-middleware and connects to a node, and downloads its entire blockchain into a Postgres database, then keeps the DB up-to-date with new blocks as they arrive. It’s written in Rust, and we’d welcome any contributions to it, as well. Don’t forget today is the last day to participate in the Dashboard Bounty. See the details above and take your chance!!! It’s an honor to be involved~the code of https://www.aeknow.org/ has been submitted to github as I filled in the form above. I’ll keep improving it in the next 2 month! The bounty is now over! Thank you all for participating. We will review all submissions and let you know soon.